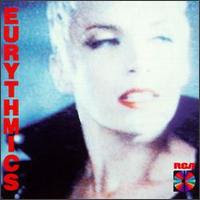 For some reason, this has always been the one Eurythmics album I've continuously had a copy of. I used to own the cassette (maybe I still do), and I still have this LP on the shelf. I have a vague recollection of owning both their Greatest Hits on CD and Touch on LP, but those seem to be gone. Maybe it's because "Would I Lie to You?" is my favorite song of theirs and also one of my guiltiest pleasures. Annie Lennox's voice on that song is just huge. I've always been a sucker for it. Maybe it's because it's the least synthy of the Eurythmics albums I'm familiar with, and I feel like it's more of a soul record than anything. (Not that I'm some sort of soul freak, but, y'know.) Maybe I find "Sisters Are Doin' It for Themselves" to be so campy that it's awesome. Maybe it's all of these things. I'm realizing I haven't listened to this record in a long time. It's another one of those LPs that I just like to know is there, sitting on the shelf, in case the need arises. Apparently that need hasn't bubbled to the surface in quite some time. But if it does, I'll be prepared. Oh, and I like "Adrian," Lennox's duet with Elvis Costello. Solid pairing. I didn't know you had this. I will be listening to it tonight. Sucka.